Diana and her partner who run the Casa Quimbaya live outside Armenia on a farm which will soon be available as an alternative hostel to the one in town and they had invited me and M to spend a night there. The house which will be named Casa Quimbaya Outdoors it is just a twenty minute bus ride south of Armenia on the road to Barcelona. Another unique hostel, this is the only one where you can stay on a farm outside of the immediate vicinity of Salento which has several farm/hostels. We left our big rucksacks at the town hostel and hopped on a little local bus towards Barcelona. The bus driver duly dropped us off at a roundabout and we walked for about ten minutes along a small lane to the house at the end of the track. Only built ten years ago the house appeared older with wooden floors, stairs and a wrap around veranda. 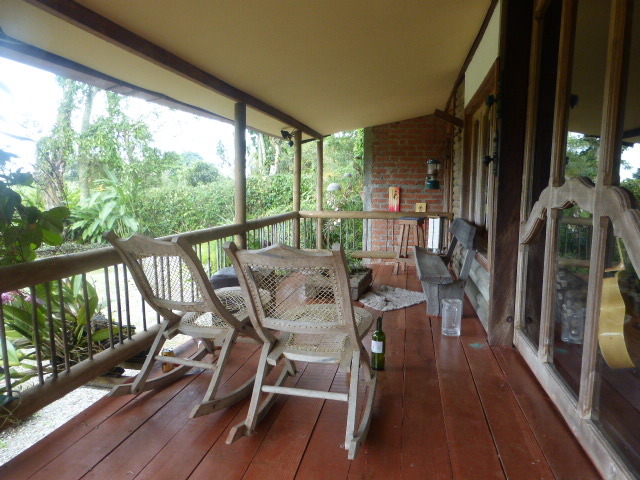 There will be several rooms and sleeping combinations available to visitors but the highlights have to be the large living room with comfy cushions and chairs, the veranda, the gardens and the peace and tranquility. Out here, breakfast is included in the price of accommodation unless you opt to camp in the level camping area in the large garden and there are plans to cater for lunches and dinners too if required, although guests will also be able to use the kitchen. We ordered out that evening from a local restaurant (the Don Alfredo) that delivers for a nominal charge and we enjoyed the typical food of the region sat around chatting. When we arrived the sun was out and brightly coloured tropical birds darted around the trees and bushes in the garden and you couldn’t hear any traffic noise at all. Me and M were walking around the garden just looking when we came across Jose, the man who lives next door, feeding his goats. 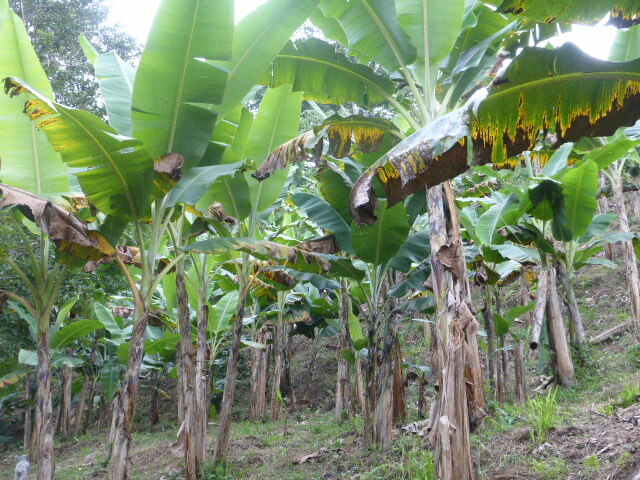 Holstering – or should that be sheathing – his machete, he offered to show us around his and Diana’s land. Leading us down the steepest of slopes he proudly showed us his banana plants and avocado trees. Clinging on for grim death so that we didn’t slide down the hillside into the river at the bottom we followed him around, keeping a wary eye out for tarantulas, snakes and tigretos (little tigers – but he may have made that one up to scare M). Like many very steep but cultivated mountainsides in Colombia, the land is not terraced but little pockets of earth are scooped out and the trees grow in these, giving the impression of a hanging garden from a distance as the trees appear to hover on the impossibly sheer slopes. Whilst I remember, I have to tell you at this point about one ace little feature that the hostel had. 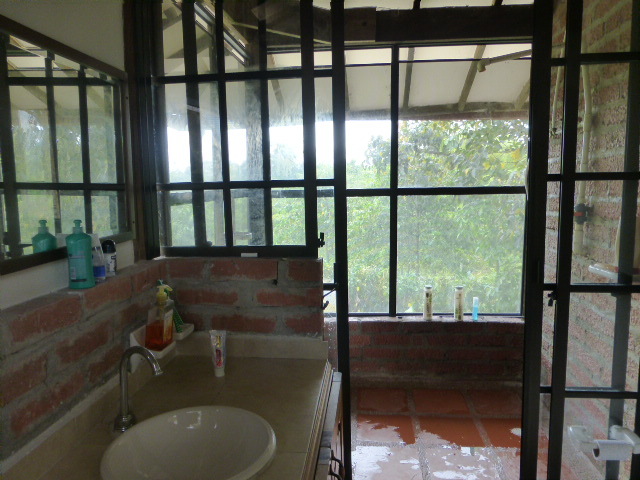 There was a massive shower cubicle in the upstairs bathroom with floor to ceiling glass windows. It was like showering out of doors and it felt very liberating and free. I just trusted Diana when she said that nobody would be around and looking up at that window from outside! Whilst in the area we took a day trip from Armenia to Salento. This attractive little town is on every backpackers list and for good reason. 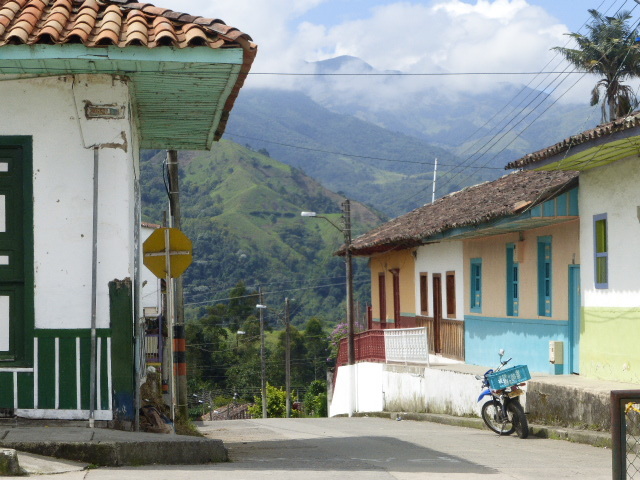 Set in the coffee region, fincas and ranches are dotted about the hillsides offering accommodation and coffee tours. 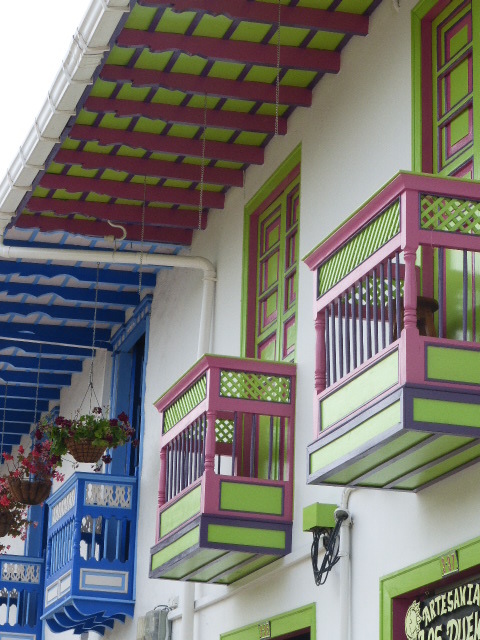 The town itself has the prettiest, most colourful buildings, with the ones near to the main plaza containing hostels or little artisan shops. Unlike a lot of places on the tourist circuit these shops offer a wide range of good quality and different local products. After arriving at the base of the valley, me and M signed up for a horse trek up into the forest. We plodded along a stony track and through several rivers for an hour and after we had finished we asked our guide if he could take us on foot to the best viewpoint for the valley in the limited time that we had. There is a four hour trek advertised but we wanted to be back in Armenia that night so we were happy when our guide agreed to take us up through the private farmland to the top of the valley. 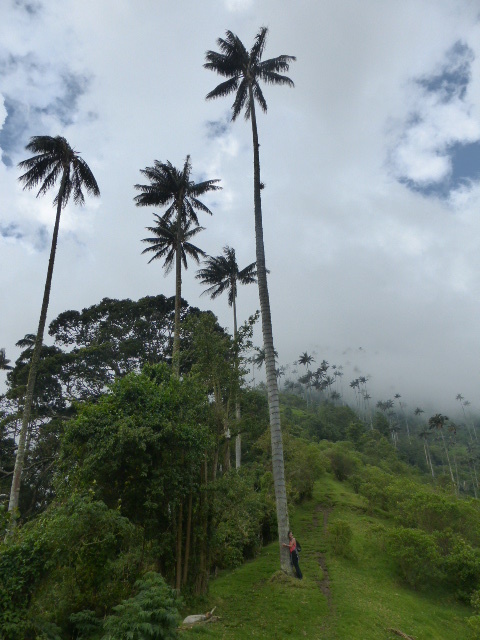 After a strenuous climb we found ourselves above the magnificent wax palm trees that the valley is famous for. 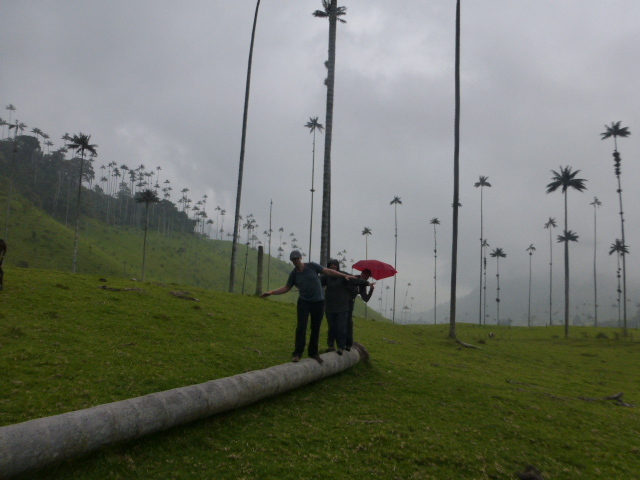 These trees grow up to sixty metres tall and they can live for two hundred years. They grow on these grassy hillsides, randomly spaced apart and I believe that I am correct to say that this valley is the only, or one of the few places in the world that you can find them. We sat on top of the hill in the sun for ten minutes until the mist came down shrouding the valley in its grey droplets and dropped its damp veil over our world. After slipping and sliding back down the hillside we sheltered from the rain on the veranda of a farmhouse where we were offered agua de panela to drink. This hard to describe drink is an infusion made from sugar cane pulp like a sort of tasty tea and is drunk all over Colombia. We sat on stools made from cut off tree trunks, watching chickens scratching about in the rain and watched by two wide eyed toddlers from the safety of the kitchen doorway. Back in Salento we tracked down a curry house – my first curry in months and then got the bus and rattled and bounced back to Armenia. 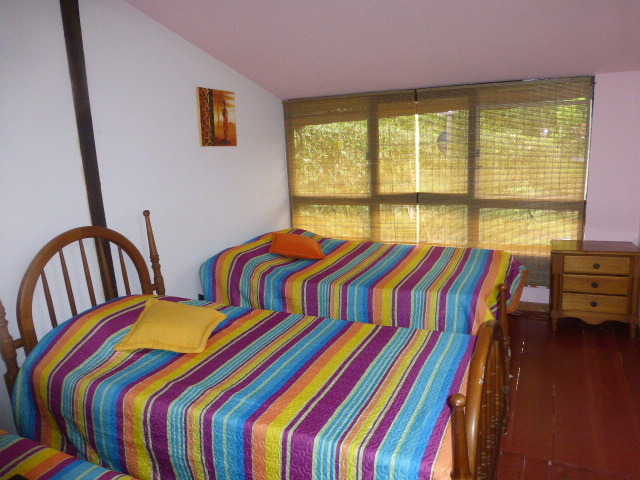 Our room at the Casa Quimbaya Outdoors was set off the rear courtyard and had brightly coloured bed covers and big patio windows out to the garden. In the evening we sat around chatting and reading whilst Diana’s partner, who is a very talented musician gently played his guitar and sang. 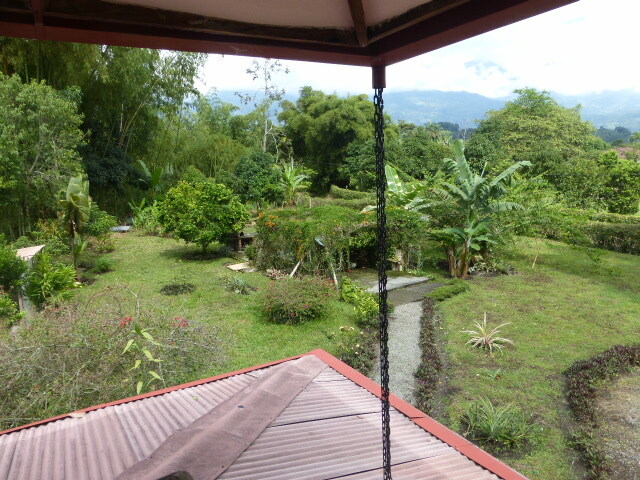 If you want a few nights peace and quiet and away from the busier hostels, come and stay at the Casa Quimbaya Outdoors. By the time that you read this, it will hopefully be up and running and ready for visitors and is not so far off the beaten track that you feel isolated or secluded. As I travel around South America I am looking for my most favourite place. I had thought that it was Peru until I moved on. I don’t think that it is going to be possible to name one place or one area or even one country, but I know that Peru, and the north in particular, will remain very special to me. I have felt the safest travelling in Ecuador but the people in Colombia are the smiliest and they will chat to anybody. Here in Colombia my favourite largish town has been Armenia, the small town has been Amaga and the best city is Medellin (although I will be visiting Cartegena soon), and I do hope to return later this year and check out all the bits that I have missed. I also hope to return and to revisit the coffee farm that I spent a day at (I am currently writing an article for that epic day) and I will return to Ecuador and Peru too.